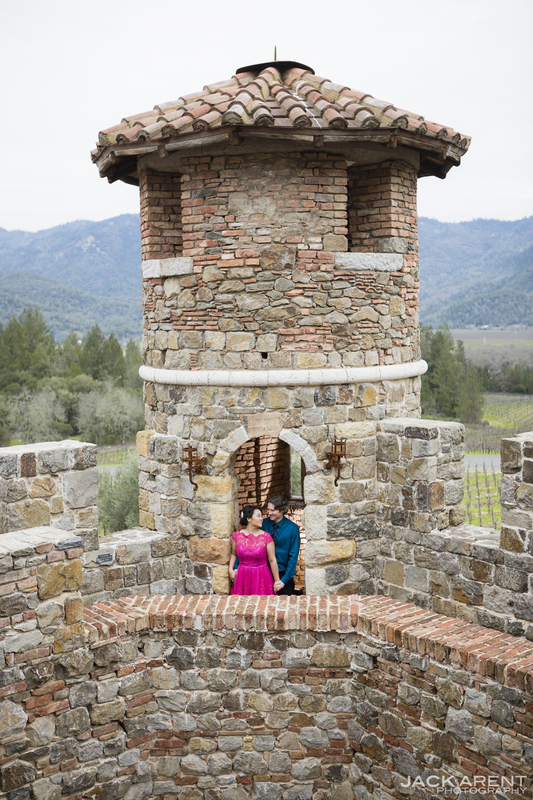 Last week I had the privilege of photographing Jane and Owen at the beautiful Castello di Amorosa in Napa Valley. We started the shoot by photographing the establishing shot in front of the castle because we had a cloud overhead which made for a natural softbox, which got rid of a harsh shadow on the castle wall. We then moved inside and headed to the towers to make a few more natural light portraits. I was excited for this particular engagement photoshoot because I knew I would have the opportunity to use my lighting equipment in a nontraditional way at some point in the shoot. I began by photographing Jane & Owen in the first tower doorway and simply outlined them by filling the tower with light. Our host and guide Jason Hayes with Castello di Amorosa, lead us on what was the private portion of the tour. During the special tour we were able to view the dungeon, (which had an authentic iron maiden) armory and private apartment among other areas which were off limits to the public. Furthermore, Jason explained that the castle was built to specifications of the 13th-century and cost 40 million dollars in materials alone. We moved on to the very dark and mysterious wine cellar portion of the tour, this is where I knew I had to light the entire scene to make a portrait quality picture. I came up with a one light snooted arrangement and used creative framing in the tight quarters of the barrel room to set the scene, the result was a moody and saturated portrait. In the following room I use a two strobe setup to light the couple and foreground. 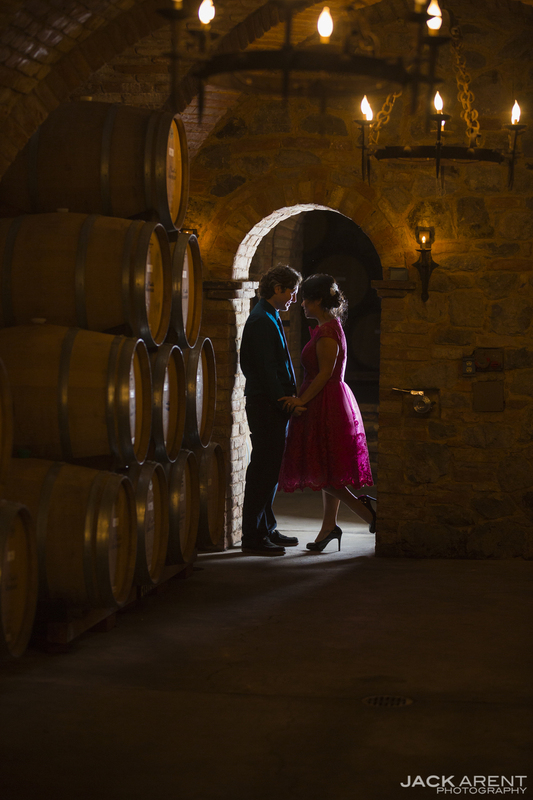 Both strobes gave a subtle shimmer of light among all of the stacked wine bottles surrounding Owen and Jane. At the end of the day we were all pretty excited to thumb through the images on my camera back. 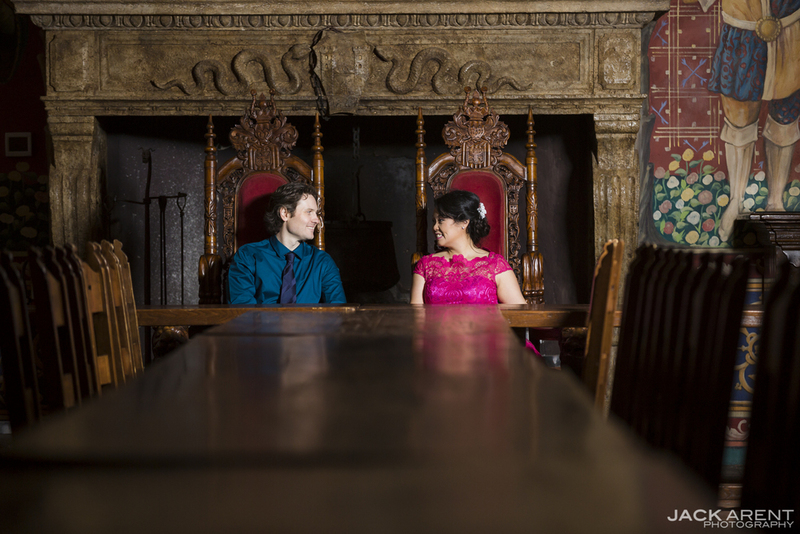 All in all we had an awesome private engagement photoshoot tour at Castello di Amorosa.